Today is a HUGE day in the Star Wars universe. The force is definitely strong with this day. 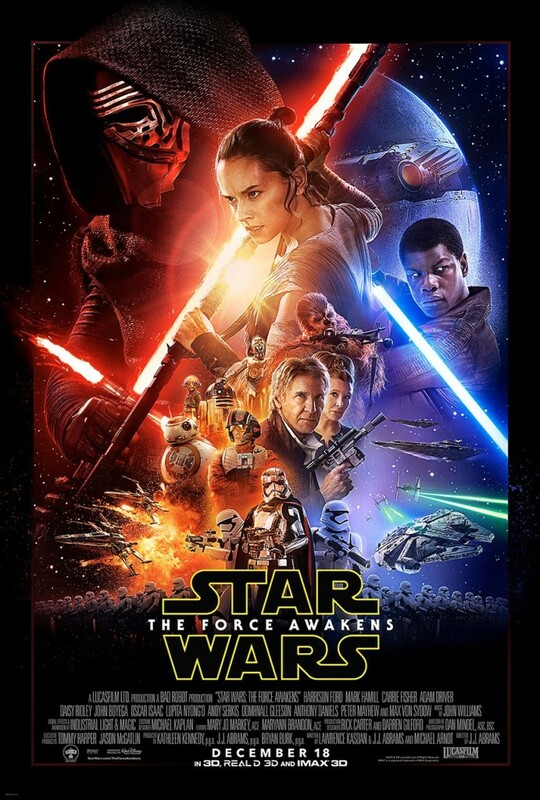 Yesterday the official Star Wars: The Force Awakens poster was revealed as a teaser for the trailer debuting today during Monday Night Football on ESPN. Tune in during the Eagles and Giants halftime to catch a glimpse at all the excitement to hit theatres in December. Then run don’t walk to grab pre-sale tickets for the film nationwide. It must have been the force at play that I hadn’t gotten the boys birthday cake up. This year they decided they wanted to match their Halloween costumes and go with a Star Wars theme. 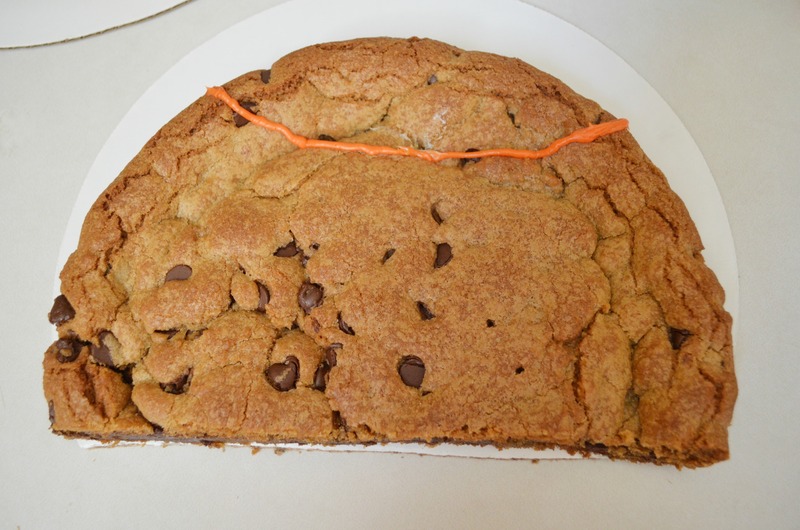 Both brothers aren’t huge on cake so we always do a big chocolate chip cookie cake. The pizza pan I use was the perfect starting point for BB8. 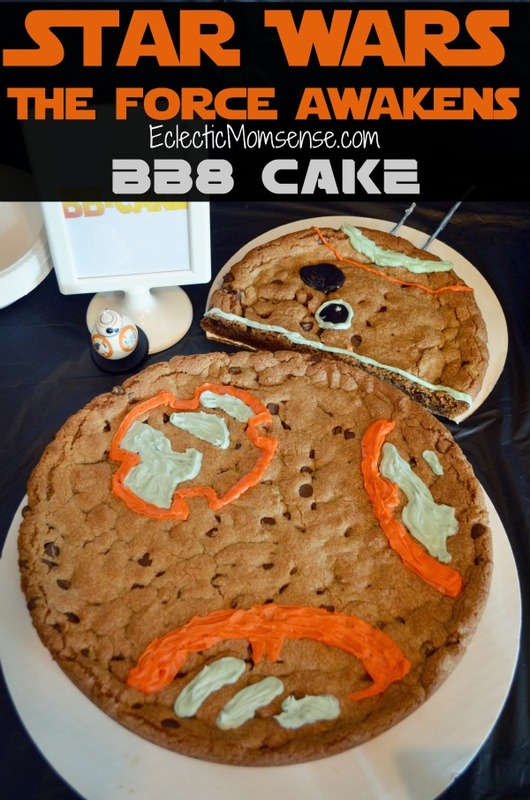 His round shape and iconic colors made throwing this BB-cake fairly simple. 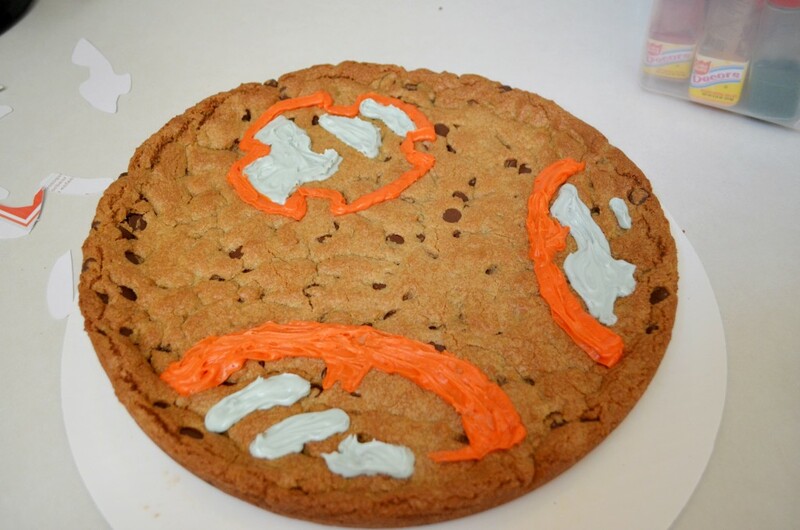 If you can color in the lines you can make this cookie. 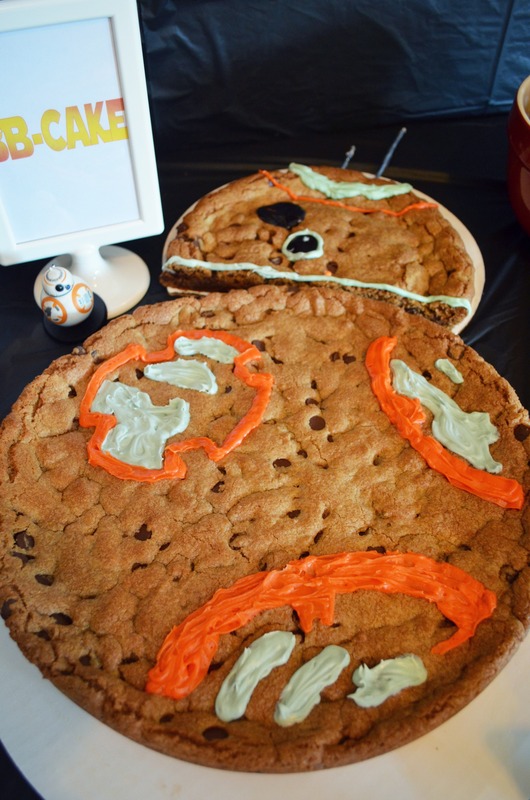 Star by baking your cookie dough. One batch in the pizza pan and a half batch in the pie pan. Cook up the remainder any way you like or freeze for later. Cut 1/3 off the bottom of the cooled pie pan cookie. Using a thin piping tip, pip an arch with orange icing along the top. Pipe a second arch above the orange with a medium flat tip in gray icing. 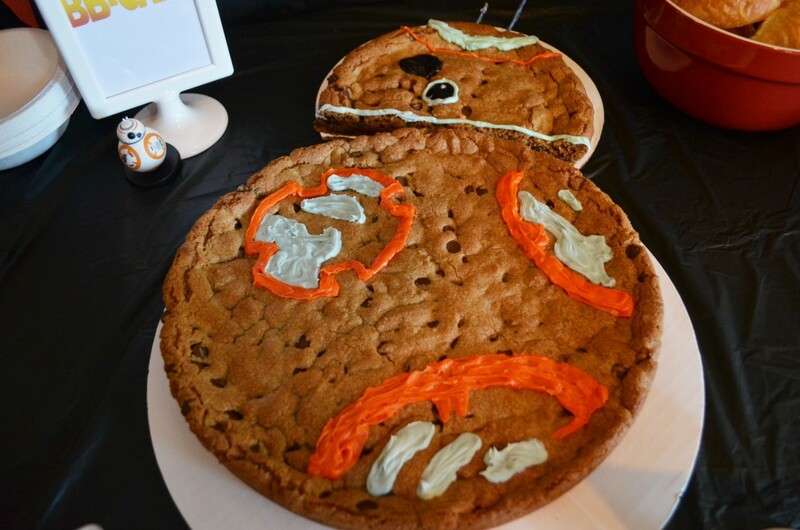 Place a thin gray stripe lining the bottom of BB8’s head. Using black icing or writing gel create one large and one medium circle on the center left of his head. 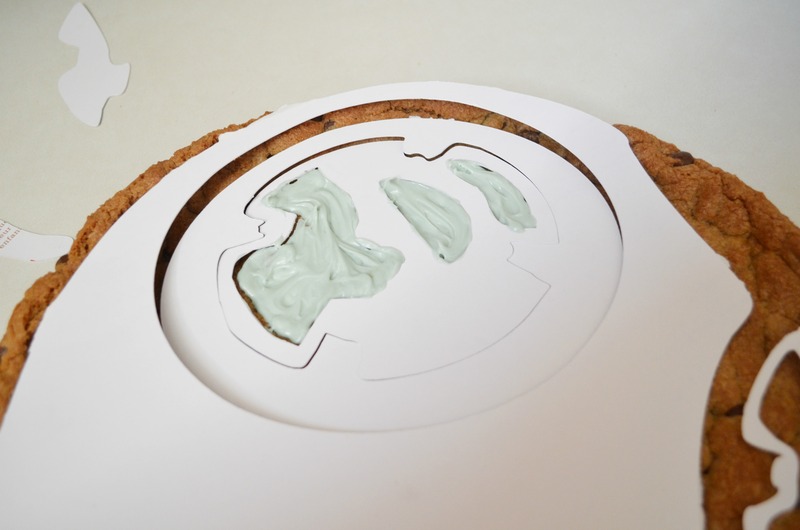 Outline the medium circle with gray icing. Place the stencil, or if you are awesome, go freehand. 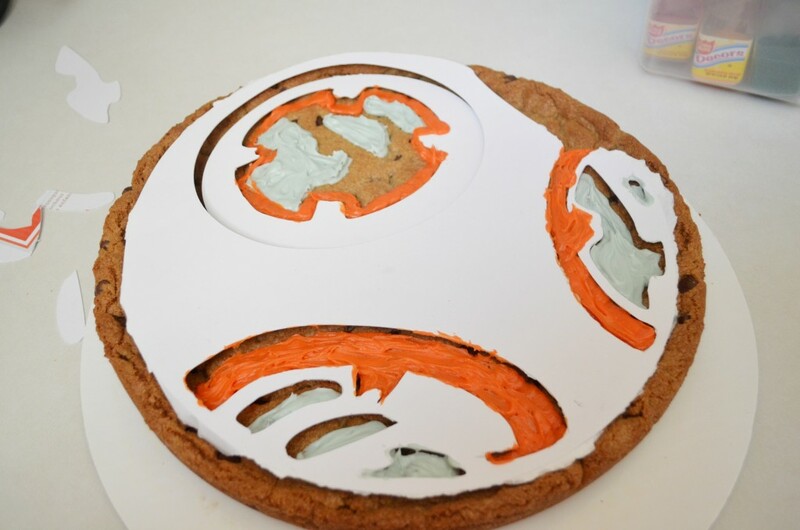 Pipe in BB8’s body with orange and grey icing. Finish BB8 off with 2 antennae. Break 1 bamboo stick into 2 pieces; 1/3 and 2/3. 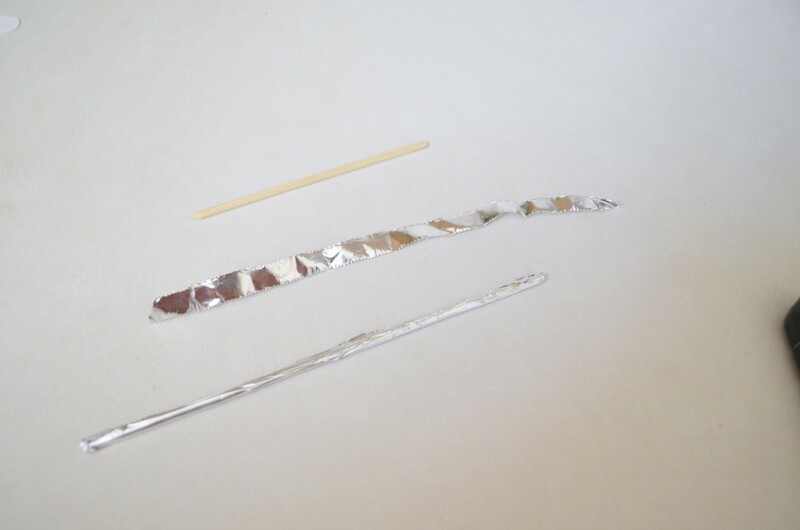 Wrap each stick in aluminum foil. 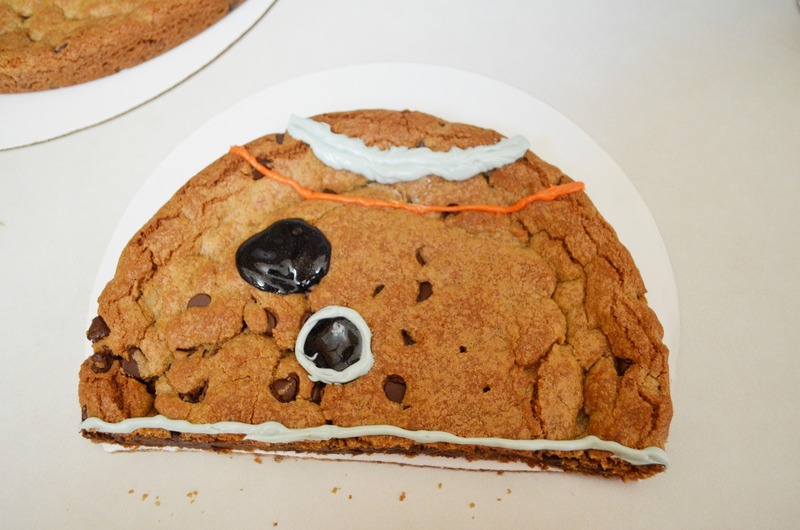 Stick each bamboo antennae through the top of the cookie helmet. 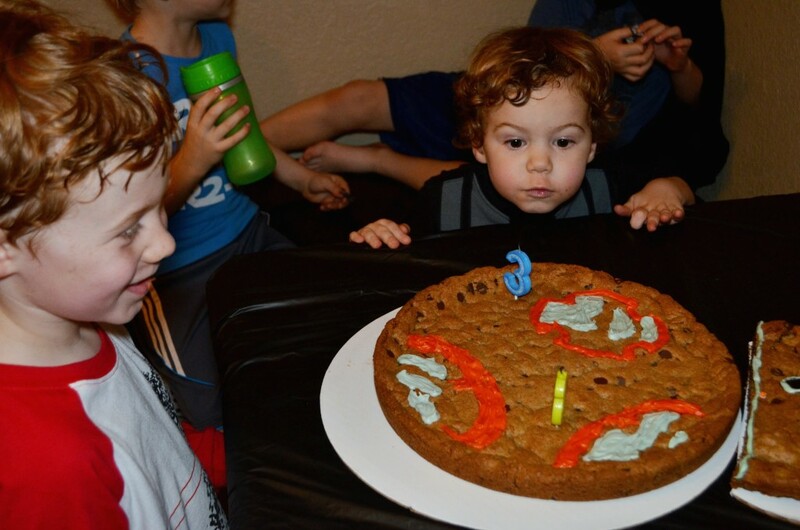 It is no surprise this BB-cake was a hit. Since the first teaser trailers our whole family fell in love with the adorable rolly droid. I can’t wait to see what part he will play in the highly anticipated seventh installment of Star Wars! 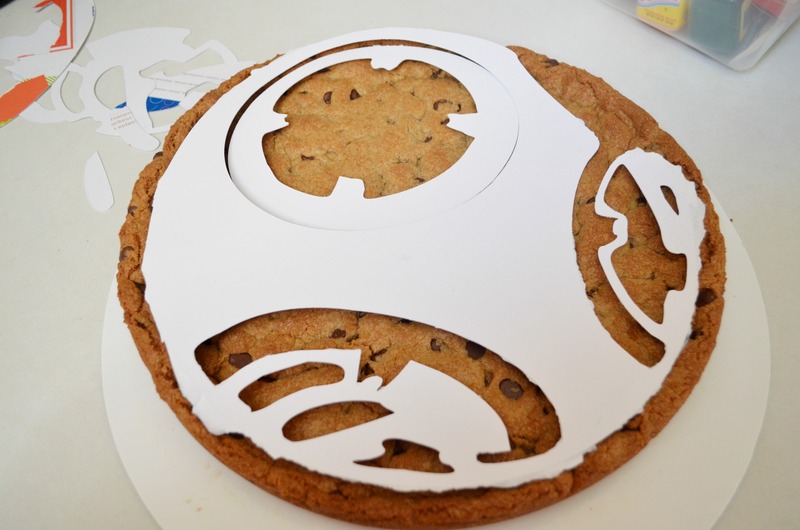 While you wait patiently to see the full Star Wars: The Force Awakens trailer tonight checkout these other fun Star Wars crafts and tutorials. Did you use a normal pizza pan or one that has edges like a deep dish pizza pan? A deep dish pizza pan. You’ll need the edge so it doesn’t spread. Any chocolate chip cookie recipe works? Hi Pearl any recipe should work as long as it doesn’t spread. Something a bit more chewy or crunchy works best for cookie bars. Where did you find your stencil? I used a coloring sheet and blew it up then cut out on my Cricut. 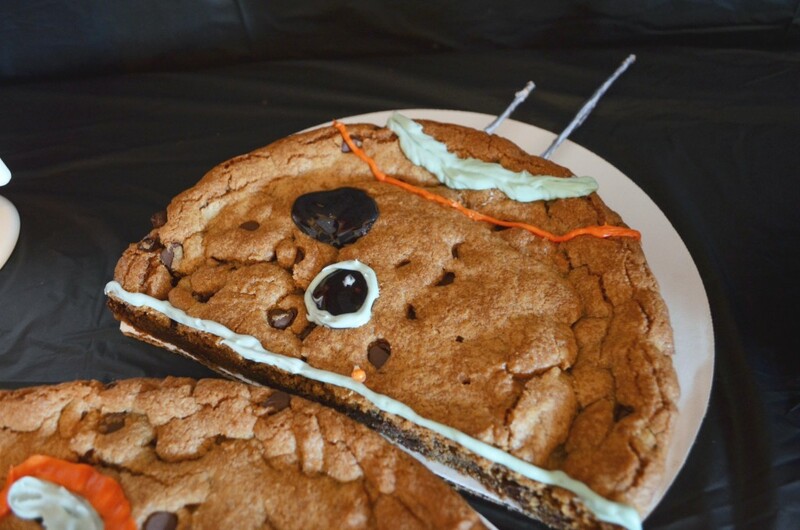 I’m so excited to make this for my son’s 8th birthday. Quick question, how many would you say this serves? We are having more people than I thought come over and I want to make sure I have enough! Thanks again! Also, what size pizza pan did you use? Hello. 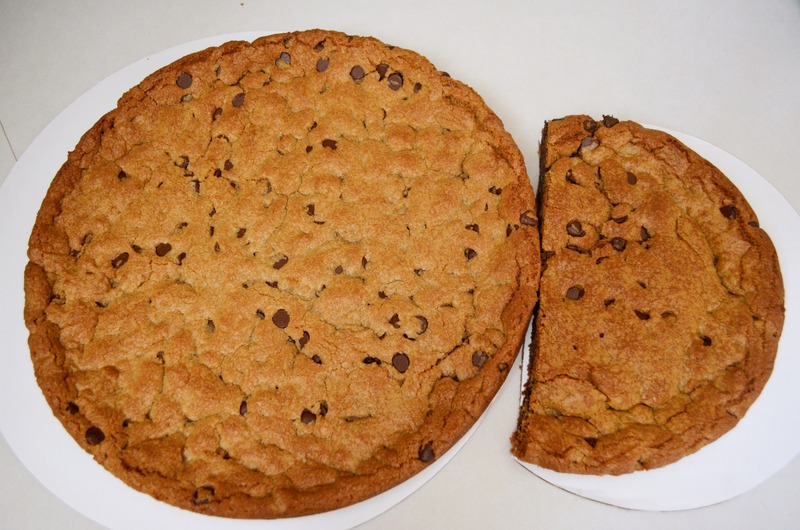 The large pizza pan is a 12″ and the smaller is an 8/9″ pie pan or cake round. For a single serving you can comfortably feed up to 30 people with the two pans. Thank you for your fast reply! Any tips for getting the cookies out with breaking them?